Learning traditional tai chi chuan (taijiquan) requires patience, perseverance, and a plan. 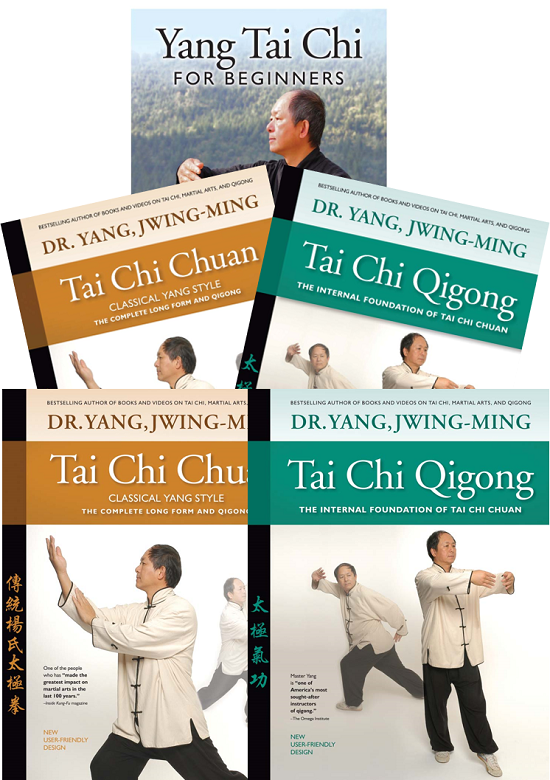 With this carefully assembled bundle by Dr. Yang, Jwing-Ming, you can be assured that you have a well developed plan for success to begin your traditional tai chi journey. The tai chi path is filled with rewards large and small, each following a challenge won. Coordination, concentration, balance, relaxation, to name a few. Within weeks small rewards begin, in months dramatic changes take root, over years, tai chi practitioners become closer with the nature of all things. Oneness with nature is the ultimate goal of tai chi. Becoming stronger, healthier, wiser, and more understanding are just some of the rewards along the way. Bundle contains 2 books and 3 DVDs. The essence of Tai Chi (taiji) contains special qigong movements. In this book every qigong movement is presented in 2-4 large photographs with clear instructions, followed by a discussion of how the movements aid in improving Tai Chi practice. Tai chi chuan is an internal martial art that uses soft/round movements to redirect an opponent's incoming force. Qigong exercises are an internal method of increasing and circulating your body's energy (qi). This book teaches tai chi qigong exercises that are useful for improving your tai chi skills and overall health. Here are a few ways that you will use tai chi qigong to reach new levels of skill and ability. In addition, regular Qigong practice accelerates the health benefits of Tai Chi. You'll enjoy reduced stress, a stronger immune system, and a deeper awareness of breath and body coordination. This authoritative guide can be used with any style of Tai Chi Chuan, and it is a great way for anyone to energize the body, raise the spirit, and deepen your understanding of your practice and your health. This DVD is where everything comes together. Not only an instructional DVD, but a living document designed to preserve a cultural tradition from the original Yang Style lineage. This Taijiquan (Tai Chi Chuan) program offers enough content to build a solid foundation for a lifetime of practice.